The "Signal Path" - Where is it? Audio manufacturers frequently make the claim in their publicity material such as "there are no capacitors in the signal path", or "the volume control potentiometer is not in the signal path". To an uninformed reader the image of a circuit acting as a kind of pipe from input to output is seductive, and it's tempting to imagine that this pipe somehow insulates the valuable signal from harmful influences outside it. This implies that anything not directly in the so-defined "signal path" is somehow less critical to the sound quality (and wilfully jettisons all the effort some designers put into providing a proper grounding scheme, but that's another story). Editors of even mainstream audio magazines are all too willing to let this kind of statement through, despite the fact that it is completely unfounded in reality. The most potent fallacy seems to be that if a component is not in the series leg of the signal path (outside the "pipe", as it were) it has a negligible effect on the signal. To see why this is not the case, let us consider a simple potential divider consisting of a shunt element Z1 and a series element Z2. These may both be pure resistances, but one or both might be capacitors or more complex impedances. Let the input voltage signal applied to the upper end of Z2 be Vi, and let the output signal at the junction of the two components be Vo. The fraction of the input present at the output is then simply given by A=Vo/Vi, which is equal to Z1/(Z1+Z2). The signal across the series element is then the signal "lost", or a factor Z2/(Z1+Z2) of the input. It's clear that neither of the elements is more or less important than the other. In particular, the output signal is directly proportional to the shunt impedance Z1, and the whole signal is present across the shunt component. One example of this is the volume control potentiometer, where some manufacturers such as BAT make only the shunt element variable. For the sake of a debatable improvement in performance, this discards the benefit of a constant input impedance, as well as making it harder to get a useful relationship between attenuation and knob rotation. Despite this, the proponents claim that this in some a priori sense improves the sound quality. OK, I admit that I've never critically listened to the two configurations next to one another, and it may be the case that the "shunt" volume control sounds better in some circumstances and with certain combinations of components, but it certainly isn't because the variable leg is "out of the signal path". Another example is the ubiquitous large electrolytic capacitor shunting the feedback loop of almost all solid-state power amplifiers sold today. 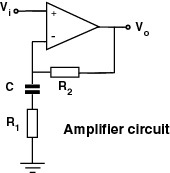 This reduces the DC gain of the amplifier to unity, while ensuring that its AC gain is equal to 1+R2/R1, and is essential in these circuits to prevent unbalanced leakage currents in the input stage causing a possibly large DC offset voltage at the output. Most publicity blurb conveniently neglects to mention this capacitor, as it's firstly not attached to the "direct" signal path, and secondly is a shunt element and so doesn't count anyway. Brief consideration reveals that all the components in the feedback circuit are important in determining the gain, and hence the frequency response, of the amplifier, and this capacitor is therefore among the most critical of any component in the circuit. The quality of this capacitor is important both at low and at high frequencies. At the top of the audio range, the series inductance of a standard 220uF electrolytic is not negligible, while at the low end, Douglas Self and others have found that using a capacitor of too low a value and with too low a voltage rating can make this component the dominant source of low-frequency distortion in a power amplifier. On top if this, many amplifiers add one or more diodes in parallel with the capacitor to prevent reverse biasing electrolytics, which adds further distortion. A similar case occurs where preamplifiers and power amplifiers have a servo circuit to control DC offsets. These are usually composed of an integrator circuit based around an op-amp, which is then placed either in the normal negative feedback circuit of the amplifier or in the input circuit so that it modifies the bias current in one leg of the input stage. Either way, the servo still has an influence on the overall low-frequency gain of the amplifier through the feedback loop, and is therefore in the signal path, and the quality of any components (particularly capacitors) in this circuit may be audible or at least measurable. I have also come across commercial amplifier circuits advertised as "all-discrete", despite the presence of an op-amp IC in the servo circuit. Any servo setup which is removed from the signal path is of course by definition useless, and manufacturers such as Mark Levinson (in the user manual for their No. 33 power amplifiers, for example) are talking out of the wrong part of their anatomy when they claim that there are no capacitors in the signal path. Many valve amplifier stages have a resistor between the valve cathode and ground, which has the dual role of setting the bias current through the valve and providing local degeneration to define the voltage gain more precisely. If only the first is needed, this resistor is bypassed with a highish value capacitor to increase the AC gain of the stage. This is usually an electrolytic capacitor, since the cathode resistor tends to be between 100 and 1000 ohms and so requires at least a few tens of microfarads. Some valve designers avoid using electrolytics as far as possible, and there are tricks to avoid the cathode resistor - for instance battery bias for the grid as in recent implementations of the Loesch design, or even using a battery in series with the cathode. However, the cathode bypass capacitor is another component whose functioning is essential to the fidelity to the signal, but which is often conveniently excluded from the "signal path" paradigm. The vital question concerning component quality in any circuit is whether the circuit would sound different if a given component were removed. If the answer is "no", then the component may be safely omitted and the cash saved. If the answer is "yes", then the component needs to be functioning correctly for the whole circuit to work as intended, and its quality is an issue, although how much of an issue is a separate question. An example is the reservoir (smoothing) capacitors in a power supply - these are called upon to supply an extremely high ripple current a hundred times per second, while at the same time needing to have a vanishingly low impedance from a few hertz up to ultrasonic frequencies. Shortcomings in the power supply don't show up readily in the simple steady-state measurements published in manufacturers' spec sheets and in the tabloid audio press. Building a proper power supply gives serious subjective improvements, which are also apparent in more sophisticated measurements, but calls for careful component selection and serious investment. Here incidentally lies one big advantage of DIY, as one can progressively and consistently improve components in a project without any input from the marketing department (though inexplicably some DIY projects on the Web still promote this "signal path" myth). I recently discovered an old article by Ben Duncan in his Black Box series for Hi-Fi News and Record Review (September 1996), which echoes pretty much the drift of what I have written here. He adds that there is one case which especially disproves the "signal path" myth: a forward biased diode connected in series will pass a signal with negligible distortion, whereas a diode and a relatively high-value resistor connected across the output of a power amplifier will add high levels of audible distortion.